A CL-Out bioremediation push-pull pilot study was implemented at a confidential dry cleaners site to verify the applicability of CL-Out bioremediation to the site and to determine whether the availability of oxygen to support cometabolism of the halogenated solvents would limit the bioremediations. Although the impacted ground water was relatively shallow, the site geology was complicated and varied across even this small site. In general the glacial deposits at the site were mainly till with interbedded sandy and silty zones. The impacted ground water was contained within the granular deposits. The main ground water contaminant was PCE with lower concentrations of TCE, cis -1,2 DCE and vinyl chloride. In the pilot study area, the PCE concentration was 44,200 μg/L and the total of the daughter products was 14,750 μg/L. A pilot study was completed in the source area in the fall of 2009. One unit of CL-Out was injected into the affected ground water in the source area. One unit of CL-Out is a 55-gallon slurry with a microbial concentration of 109 cfu/ml. The CL-Out microbes were injected with 50 pounds of dextrose to provide a carbon source to support the energy requirements of the population. Pre- and post -treatment samples were taken on February 19 and December 10, 2009. The post-treatment sample was taken after the monitoring well was purged of the injected volume. The following table shows the contaminant concentration trends in the treatment area. The pilot study verified the applicability of CL-Out bioremediation to the site. The total concentration of CVOCs was reduced from 59,000 to 13,740 μg/L. The CL-Out bioremediation was most effective in the removal of PCE and TCE. There was an increase in vinyl chloride suggesting some incomplete reductive dechlorination, probably by native dehalogenating organisms. Full-scale treatment will be most effective with the addition of an oxygen supplement to limit the dehalogenation and promote the cometabolism of the daughter products. Overall the push-pull pilot study verified the effectiveness of CL-Out bioremediation and provided insights for making full-scale application more effective. Petrox DN® bioaugmentation was implemented at a poultry processing plant to deal with a recurring problem of excessive ammonia levels in wastewater discharge. Petrox ND® bioaugmentation reduced the organic carbon load in the wastewater and converted the ammonia to nitrogen gas. Within 48 hours of treatment the ammonia levels in the wastewater were reduced to acceptable levels and discharge limits were maintained. Wastewater treatment requires the treatment of a variable waste stream with limited control over the volume and concentration of the raw material and only moderate control over the operating conditions. The goals for organic wastes include the removal of organic pollutants, reducing the total organic load, reducing nutrient concentrations including nitrogen, and odor control. Removal of ammonia and nitrogen compounds are typically achieved by a two- step process of nitrification of the ammonia and denitrification of the nitrate. The autotrophs Nitrosomas sp. and Nitrobacter sp. are typically involved in these steps. As autotrophs these microbes use carbon dioxide instead of organic carbon to build cells, organic wastes are not treated by this process. The Pseudomonas sp. in Petrox DN® oxidize the organic carbon wastes converting it to cell mass, carbon dioxide and water and generating stored cellular energy. Simultaneously, the Pseudomonas sp. in Petrox DN® remove ammonia and nitrogen by utilizing these compounds as a nitrogen source for cell growth and electron acceptors during the consumption of the organic wastes. The benefit of Petrox DN® bioaugmentation is the removal of both the organic waste, nutrients and elimination of ammonia odors. Pseudomonas sp. are also cold water tolerant, so Petrox DN® can be used year round under most under natural conditions. The plant generates 0.85 million gallons of wastewater per day with ammonia levels of 80 to 120 ppm. The wastewater after primary treatment and equalization flows into a 7.5 million gallon anaerobic lagoon and subsequently four sequencing batch reactors (SBRs). At the end of the settling cycle, the supernate discharges to a receiving stream. Bench-scale laboratory studies showed that nitrate could be removed at a rate of 17 mg/L/hr under aerobic conditions and at a rate of 12 mg/L under anaerobic conditions. TOC could be removed at a rate of 45 mg/L/hr. Petrox DN® bioaugmentation was initiated in the aeration basin and the SBRs. After less than 48 hours the wastewater met and maintained the wastewater discharge limits. CL-Out® bioaugmentation was used to remediate ground after ISCO was unsuccessful in remediation of chlorobenzene isomers, including chlorobenzene, 1,3-dichlorobenzene, 1,4-dichlorobenzene, and 1,2-dichlorobenzene. At the initiation of bioaugmentation, individual concentrations were as high as 50,000 µg/L. The CL-Out® treatment quickly reduced contaminant concentrations. CL-Out® was introduced into the contaminated ground water in November 2010 by injection through temporary well points surrounding the monitoring point. One drum of the CL-Out® was injected into the ground water. The ground water treatment results were monitored by analysis of ground water samples for the contaminants of concern, microbial population, and known functional genes, including naphthalene dioxygenase, phenol hydroxylase, and toluene dioxygenase. The 30-day monitoring results show an immediate decrease in the contaminant concentrations. After 30 days, 62% to 82% of individual contaminants were destroyed. 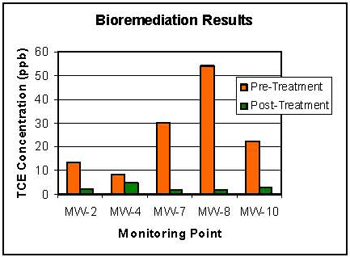 The sampling results 30 days after bioaugmentation are compared to the pre-treatment concentrations on the following chart. The total biomass increased from 1.5 million to 12.8 million cells per milliliter following the bioaugmentation. The concentration of the naphthalene dioxygenase functional gene also increased by more than ten fold, as shown on the following table. This project demonstrates several of the benefits of aerobic bioaugmentation. Bioaugmentation provides active control of the site as effective organisms compatible with the site conditions were injected where they were needed. Furthermore, the CL-Out® aerobic cometabolism was compatible with the residual conditions following ISCO treatment. Treatment will continue to reduce the contaminant concentrations to acceptable levels. The chlorinated solvent trichloroethylene (TCE) was discovered in ground water at a manufacturing facility in eastern Massachusetts. ISCO was selected for remediation of the ground water. Although ISCO reduced TCE concentrations, the residual post-ISCO TCE concentrations were above the applicable remediation standards. The environmental consultant chose CL-Out® bioaugmentation to treat the residual ground water contamination. The CL-Out® treatment successfully achieved the remediation goal quickly and at a low cost. The contaminated ground water was in a shallow, sandy, water-table aquifer. The residual contamination was located under a manufacturing building and adjacent to a river. The main receptor concerns were vapor migration into the building and contaminated ground water migration into the river. TCE was the only contaminant in ground water. Post-ISCO TCE concentrations were as high as 54 µg/L. Daughter products were not detected. CL-Out® was selected for the treatment because it is capable of cometabolizing the TCE without producing daughter products such as vinyl chloride. Furthermore, the CL-Out® organisms are aerobic, so they were compatible with the natural oxygenated conditions of the aquifer. CL-Out® was introduced into the contaminated ground water by injection through temporary well points. Three drums of the CL-Out® were injected into the ground water through 14 injection points over an area of 1,200 square feet. The ground water treatment results were monitored by analysis of ground water samples from five locations. The 30-day monitoring results show an immediate decrease in the TCE concentrations without the production of DCE or vinyl chloride. After 30 days as much as 97% of the TCE was destroyed and the ground water met applicable standards. Dissolved oxygen (DO) concentrations and oxidation-reduction potentials (ORP) were also monitored to assess the growth environment for CL-Out® organisms. Before the bioaugmentation the DO concentration was 0.47 mg/L. After the bioaugmentation, the DO concentration dropped to 0.04 mg/L, which confirms active aerobic microbial metabolism. The ORP was 208 before and 272 after bioaugmentation, which shows positive redox potential was maintained even though oxygen was being utilized. Ground water samples were tested for CL-Out® organisms by plate count analysis 30 days after the injection. The CL-Out® population was greater than 300,000 cfu/ml in 4 of 5 monitoring points 30 days after the inoculation, confirming a good distribution of the organisms and that the population was sustained at the planned level. This project demonstrates several of the benefits of aerobic bioaugmentation. Bioaugmentation provides active control of the site as effective organisms compatible with the site conditions were injected where they were needed. Furthermore, the CL-Out® aerobic cometabolism was compatible with the residual conditions following ISCO treatment. The TCE was destroyed without production of daughter products, which accelerated site closure at minimal cost. In situ remediation is a contact sport, requiring contact between the microbes and contamination. Clay-rich soils are particularly challenging as the low permeability limits effective distribution of inoculants. While numerous closely-spaced injection points can improve the distribution of inoculants, this approach is often not possible at active properties and can be costly. Horizontal drilling was used on the subject site to overcome the combined challenges of low permeability and limited site access to inject Petrox® microbes for bioaugmentation. The combined technologies reduced the total BTEX concentrations in ground water from 2,771 µg/L to 645 µg/L in less than one year. The site is a former gas station located in the Florida panhandle. The site soils are mixed silt and clayey silts that are typical of the coastal setting. The depth to the water table varied seasonally from 13 to 18 below ground surface. The underground storage tanks and contaminated soil had been removed prior to the ground water treatment. Residual ground water contamination exceeded Florida Ground Water Cleanup Target Levels (GCTLs) for benzene, toluene, ethylbenzene, xylene, naphthalene and methylnaphthalene isomers. The proposed treatment area was approximately 2,500 square feet. The treatment depth was from 10 to 25 feet below grade. The treatment depth included the capillary fringe to treat residual contamination above the seasonal low water table. Access to the treatment area was limited by the current property use, the proximity of roads on two sides and a building on the third. Horizontal drilling was selected by the site consultant, Advanced Environmental Technologies (www.aetllc.com) to deliver Petrox® to the contamination. The horizontal drill rig was set back from the treatment zone on the opposite side of the building. The horizontal injection wells were set in four horizontal sets of eight wells. The horizontal layers were at 10, 15, 20 and 25 feet deep. The wells in each layer were five feet apart. A total of 32 injection wells were closely spaces for excellent coverage through the treatment zone. Petrox® was injected into the ground water in two treatment events – November 6, 2008 and June 24, 2009. Petrox® was delivered in each injection well as the drill stem was withdrawn through the treatment zone. The injection was monitored for accuracy so that 0.2 gallons of Petrox® was injected per foot of injection zone. A total of 320 gallons of Petrox® slurry was injected. Following the Petrox® injection, air was injected periodically through vertical sparging wells to increase the oxygen availability for the microbial metabolism. Ground water samples were collected from a monitoring well inside the treatment area to track the progress of the bioremediation. Approximately 60 days after the first Petrox® treatment, analysis of ground water samples showed 84% reduction in the benzene concentration and 35% reduction in the total BTEX compounds concentrations. There was an apparent increase in the xylene concentration due to ground water mixing and induced increase in solubility due to the bioaugmentation injections. A second sampling event approximately 30 days after the second injection showed additional reduction in the contaminant concentrations. After the second injection, the total BTEX concentrations were 23% of the original concentration with xylene decreasing from 1,200 to 95 µg/L. In addition to the BTEX compounds, naphthalene and methylnaphthalene isomer concentrations decreased through both treatments. Note: All concentrations shown in ug/L. Horizontal drilling and injection made it possible to remediate ground water at this site of petroleum contamination with limited access and low natural permeability. Without disturbing the property use, the horizontal injection of Petrox® provided effective distribution of the microbes for bioremediation. The injection may have also made the contamination more available for bioremediation by increasing the contaminant solubility as shown by temporary increases in concentration. This case study demonstrates that in situ bioaugmentation may be a feasible solution for sites with limited permeability and access restrictions.